Writer + Illustrator + Baby = Slouching + Computer Slouching + Leaning Over Baby = HORRIBLE posture = Chronic Back Pain. Therefore, one of my New Year resolutions is to do yoga every night, in order to delay the day that my chin will kiss my knees (also to tuck in some of my internal organs that are casually hanging out outside my belly, in that cozy pouch that used to be my tight stomach muscles). It was meant to be for personal use, so it really is bad, but I figured you might find it useful. If not, just go watch that video. It is much more clear and detailed (but not as fun). P.S. 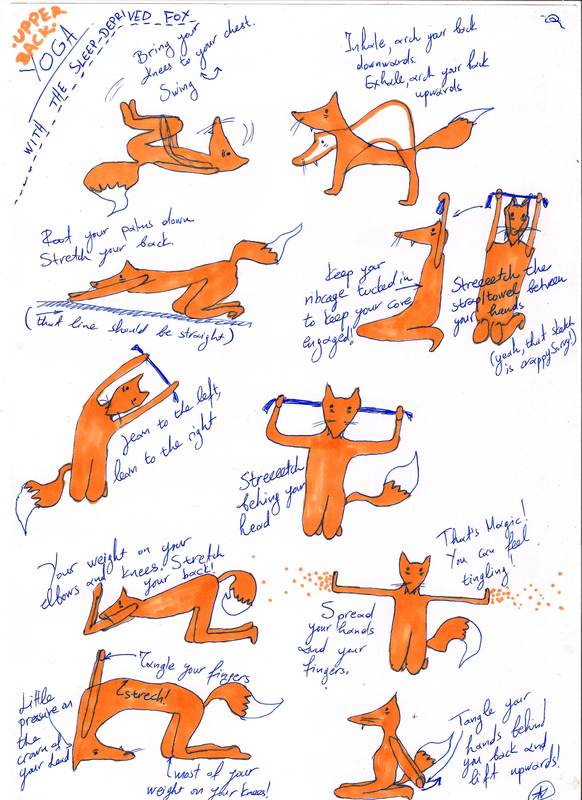 : Yes, the fox is sleep deprived. But that doesn’t keep her from doing her yoga every-single-night! Go fox! that’s why I made it in the first place Mama Blues! To put it on the wall against my desk (aka dinner table aka all purpose table). I am glad you find it inspiring and you are right, dark eye bags are totally the must accessory of 2015.